The World’s First Wireless-Enabled Sewing Machine! Connect to the machine using a wireless network in your home. Easily send designs from your iPad® or PC. AcuEdit: Portable & Playful: The complete MC15000 editing suite on your iPad. Move, Rotate, Enlarge/Reduce, Mirror Image, Vertical Flip, Centering, Cornering, Copy and Paste, Monogramming Tools, and More! When designs are ready to stitch, easily transfer to the machine via the wireless connection. 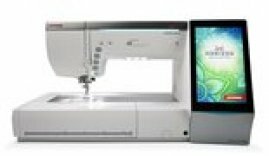 Monitor your machine remotely: Take your embroidery to the kitchen, to the play room, or anywhere on your wireless network. Check the stitch count of your design to determine time until a thread change. AcuMonitor alerts you to thread changes and machine stoppage notifications. Powerful Horizon Link Suite™ software has even more options for design, remote operation, stitch combination and an improved Stitch Composer™ tool. Create your own unique screen saver data and print templates. Large size foot controller with remote thread cutter.